It seemed that everyone I talked to this week – clients, friends, family – was experiencing a touch of overwhelm. They had a big goal or project, and it cast a shadow over them that felt dark and ominous. My shadow (actually, my dream!) is the book I have in my head that is feeling called to be on paper… and thinking of that shadow as an elephant has me fearing the beast is going to sit right down and squash the life out of me! Since so many people were in the same boat, I appreciated the reminder that eating an elephant can only be done one way: one bite at a time. Trying to gulp it down in one sitting is asking for severe indigestion. We know intellectually that the best way to accomplish something big is to approach it in smaller pieces. So why do we run into trouble? Why are we weighed down by the shadow, rather than buoyed by the dream? Most likely, we have some fear. We have some beliefs about that humongous elephant, and we’re by turns motivated and deflated by the sight of it. The first thing to do is reflect on your relationship to the elephant. Is it YOUR elephant, i.e. is it YOUR goal? Are you working on what you think you “should” be doing, or setting a goal to make others happy? If it’s not your elephant, decide how much power you want to give it. What do you have a choice about? Can you decide to release attachment to the goal, knowing you have bigger fish – umm, elephants – to fry? Let’s assume you’ve determined the elephant is one of your choosing; you’ve named it Book or Website or Relationship or New Career or Cleaning Out the Garage. How do you feel when you think about being on the other side, accomplished and full? Try renaming the elephant to reflect what you want to experience. Focus on your intention. Using this guidance, my Book elephant might sound like this: I feel empowered and confident as I share my unique voice with the world. How does that help? By focusing on what I want to feel, I am opening myself to possibility. My elephant might evolve, and if I’m too focused on a specific make and model, appearing at a specific time, I might miss an even better outcome. Be Authentic: The more “true to you” and authentic your intention and goal, the more likely you are to be committed and take action. One Bite at a Time: When you feel overwhelmed, it helps to remember to take your commitments and actions and break them into bite size, or fun size, goals. Remind yourself that you have choices about what you say “yes” and “no” to, and when and how you move forward. Celebrate Your Wins: Each time you reach a milestone, celebrate it! Treat yourself in a way that seems appropriate. Acknowledge your progress and channel that positive energy into taking the next bite. Enlist Helpers: Surround yourself with people who will support you. They may be friends, colleagues, family members, a coach, mentor or adviser. Keep connected to people who inspire, encourage and challenge you. Trust the Process: By focusing on the experience you want to have and making choices based on your intention, you can trust that you are moving towards your goal, even if things look differently than you anticipated. 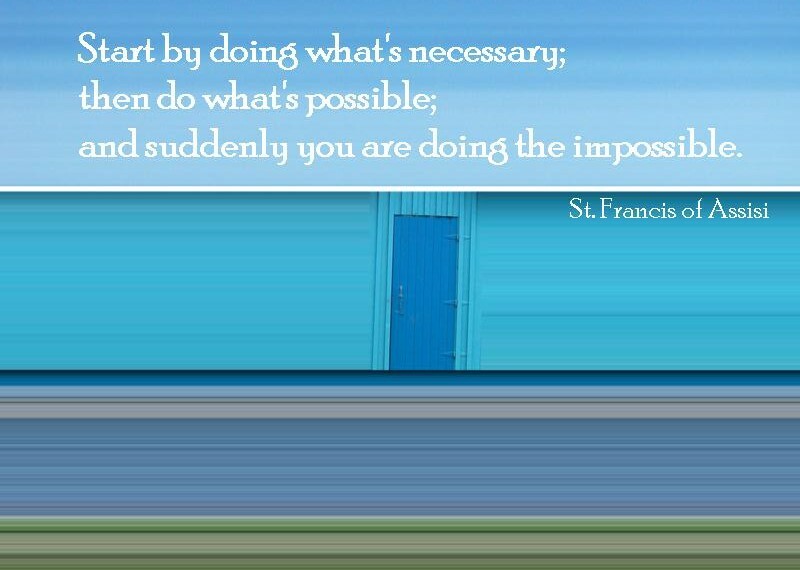 This quote from Francis of Assisi sums up how to eat an elephant: Start by doing what’s necessary; then do what’s possible; and suddenly you are doing the impossible. Ready to take that first bite? Beth, your messages are always on target — as if you know I’m facing this very dilemma now. Thanks for the motivation and I’ll heed Francis’ advice! You’re very welcome, Karen… I think the “on target”ness of my posts reflects that there are universal themes that so many of us are living at the same time; it’s affirmation to me that we’re never alone. Thanks for taking time to read and comment. I love this, Beth! I’m often on overwhelm and remembering to “chunk” things a bit at a time helps. Many thanks! Beth, this is still a fresh read. Thanks! ;( loved it. Such an inspiration. This motivates me on my problem right now. Im 22 and a college graduating (hopefully) student and ive got lots of what ifs about reaching my goal (which is to graduate). Ive read some of your post. I love it and thank you. GOD BLESS & thank you!! Rejoicing in FAITH for HIS perfect timing in ALL things for HIS glory in CHRIST JESUS.. Was so blessed I shared with my Facebook friends.. So much wisdom in this! Praying for you & sending JESUS love & encouragement in HIS matchless love & name. OMG, came across this post when looking for the “how to eat an elephant” quote and it was as if you were speaking directly to me! My elephant is also a book that has been rattling around in my head for the last few years but that I am currently in the process of committing to paper via my computer. Thanks so much for your input. You describe exactly the process I’ve been talking about in our latest article. It’s surprising how often that the phrase “Eating the Elephant” is appropriate.